← WILL REGIONAL TAKEOVER OF DETROIT WATER MAKE RESIDENTS OF 6 COUNTIES DRINK FLINT WATER? In last week’s press conference announcing that the city of Flint would finally be allowed to return to Detroit’s water system, Gov. Rick Snyder made it a point to note that placing blame for the lead poisoning of children is not something he intends to do. He wants to address the current problem, learn what can be done better in the future, and move forward. Call it the “no-blame” game. The governor’s spokesperson, Sara Wurfel, is playing it as hard as anyone right now. In an interview with the ACLU of Michigan following the governor’s tightly-managed press conference, Wurfel did the best she could to absolve her boss of any responsibility for the disastrous decision to begin using the Flint River as the city’s source of drinking water in April 2014. 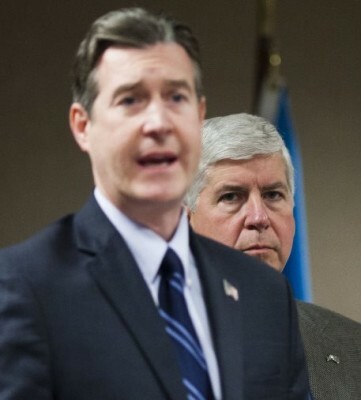 Asked about the governor’s role in that decision, Wurfel claimed that there was really no choice to be made, that the city of Detroit kicked Flint off of its system, thus forcing the switch to river water. We’re not the only one she’s trying to spin. Wurfel made a similar claim in a statement to the Flint Journal this week. 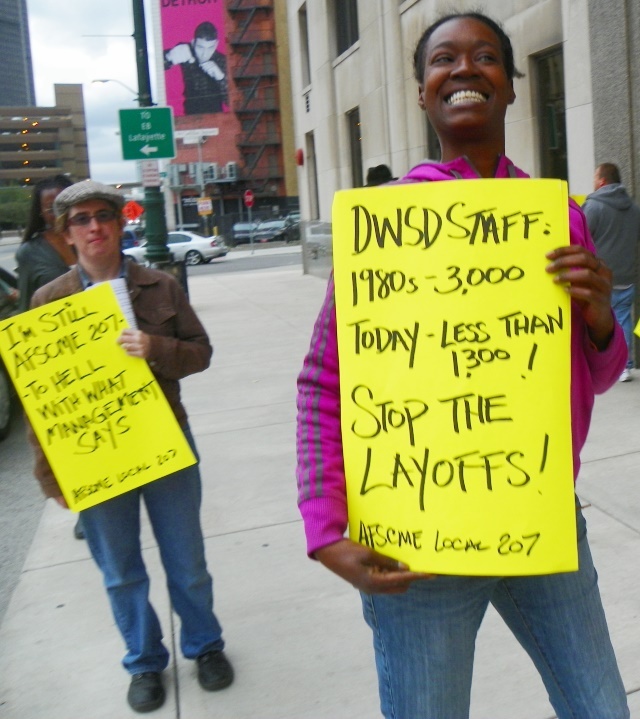 DWSD workers picket Detroit Water Board Building Oct. 13, 2015 to denounce unsafe practices for entire 6-county system due to drastic staff reductions, among other issues. According to the paper, Wurfel asserted that the city was forced to find another source of water after the Detroit Water and Sewerage Department terminated Flint’s contract to continue purchasing water under the terms of its expired contract. Maybe the Snyder administration is operating under the theory that a lie repeated often enough is eventually accepted as fact. Flint did have a choice. It absolutely could have kept using Detroit water until construction of the Karegondi pipeline, which will bring water from Lake Huron to Genesee County, is completed next year. Instead, in a decision based purely on cost, the Flint emergency manager appointed by Snyder chose to leave the Detroit system early and begin relying on the Flint River in April 2014. Because of a letter the ACLU of Michigan obtained through the Freedom of Information Act. 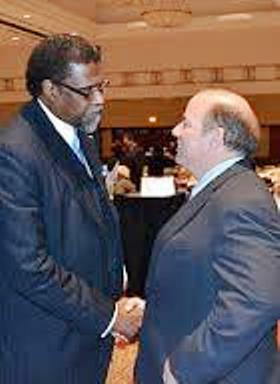 Darnell Earley, then Flint EM, with Detroit “Mayor” Mike Duggan during Michigan Municipal League convention, 2014. “Thank you for the correspondence … which provides Flint with the option of continuing to purchase water from DWSD following the termination of the current contract …”Thanks, but no thanks. As it turns out, the city, under the control of an emergency manager appointed by the governor, proved to be entirely incapable of properly treating water from the highly corrosive Flint River. As a result of that failure, children were poisoned by lead in the water coming out of the taps in their homes and, quite possibly, the fountains in their schools. Lead that was present because the river water is many times more corrosive than Detroit’s. Lead that was present because Flint officials and the Michigan Department of Environmental Quality inexplicably stopped adding the same types of corrosion inhibitors Detroit routinely puts in its water just so a public-health disaster such as this does not occur. As calls for a thorough, independent investigation of this debacle increase, the denials of responsibility by the key players are becoming farcical as they stumble over themselves in an attempt to avoid blame. 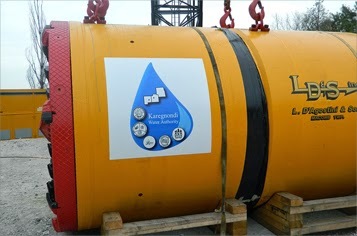 Karegnondi Water Authority’s pipeline to Lake Huron under construction. Under the state’s far-reaching emergency manager law, Earley clearly had the authority to do whatever he wanted at that point. So his attempts to shield himself from responsibility are beyond bogus. Being the current emergency manager in charge of Detroit Public Schools and its 47,000 students, it is easy to see why all this might be a particularly touchy subject for Earley – and the governor who appointed him to both positions. Fingers are being pointed in all directions, and lies are being told in an attempt to avoid responsibility. In a recent interview with the ACLU of Michigan, Flint Public Works Director Howard Croft initially tried making the same false claim as Wurfel, saying that Flint was forced to leave the Detroit system and begin using the river as its water source. Flint Public Works Director Howard Croft. When confronted with Earley’s letter, he relented, and pointed the finger of blame at the state, saying the decision to switch came from the governor’s office. But she didn’t say that. Instead, she trotted out the false claim that the city was forced to make the switch. When pressed on that point, and then asked again about the governor’s role in making the tragically bad decision to force the people of Flint to drink from a dangerous river, she again tried to slip out of giving a direct answer. So she is not addressing a direct question because it is not accurate? Questions are neither accurate nor inaccurate, but answers should be. There is usually a compelling reason why evasion and obfuscation are the responses to a yes or no question. And the reason is this: The people doing the evading are afraid to tell the truth, and even more afraid to face the consequences that come with it. 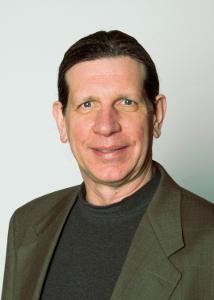 Curt Guyette is an investigative reporter for the ACLU of Michigan. His work focuses on emergency management and open government. He can be reached at 313-578-6834 or cguyette@aclumich.org. Taxpaying Residents United for 21st century Education, is a coalition of 26 Michigan groups, 2 national organizations, concerned teachers, a variety of leaders with a 10 point mission statement. We feel poorly represented in safety checks and balances, and wish to assert a complaint on the issues of state knowledge of lead in our water and a breakdown of public safety principals, protocols, best practices and communication under PA 436, as practiced by the State of Michigan. 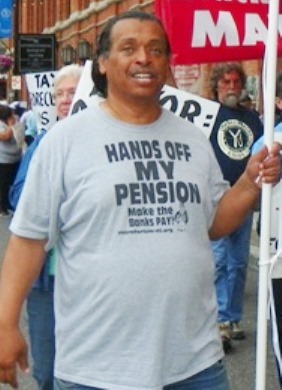 Bill Davis, Pres. of TRUE. PATTERN OF BREAK DOWN OF PUBLIC SAFETY: As Emergency Manager of Detroit, Kevyn Orr did not apply for Federal grants or use Federal grants available through FEMA, while fire fighters needed more personnel and equipment. He also shut the electricity off on all residents in the City on September 11, 2013 so that traffic lights stopped, the court house went black, fire house doors would not open, and people were stuck on elevators. People were evacuated from buildings and productivity of businesses was lost. 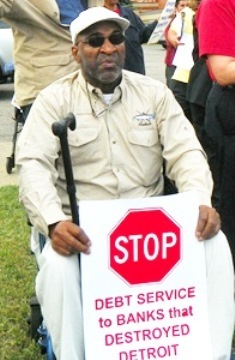 He caused unnecessary harm and chaos, yet Gary Brown stated this was done to send a message. The United Nations also cited Detroit for human rights violations due to mass water shut offs which increased asthma and sepsis and resulted in among the greatest number of e.coli and other bacterial outbreaks in the nation that year. Under PA 436, state departments like MDEQ and MDHS are one entity with the Emergency Manager, as the EM making decisions is an employee of the state. Under normal democracy, the State would represent the best interests of citizens to come to tell a town or council that actions were a threat to public health providing checks and balances. JURISDICTION: The State is a recipient of Federal funds. Educational environments should be safe. There is a disparate impact on women and the minority community and a disparate environmental impact on the poor. Emergency Managers, Ed Kurtz and Darnell Earley, knew or should have known, that stopping flow of water from the Huron River and releasing Flint River Water to the treatment plant and into the tap of Flint Schools was dangerous. Ed Kurtz, the Mayor of Flint and the appointed rather than elected City Council, under PA 436 chose to focus on money savings in an area where such a mistake could risk public health and result in death, long term disability, and illness. 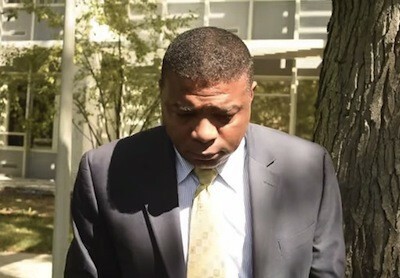 Emergency Manager, Darnell Earley, knew or should have known, lead levels were rising rapidly and did reach 6ppb, and that 6ppb under current standards, could pose a health risk because the EPA has informed all water departments of new testing, that while not mandated, could help provide a clarity on the true health risk. A reduction in samples was allowed in taking samples from January to June, with the paltry excuse that the population had dropped below 100,000, despite rising lead levels. The population is over 99,000. On or about July 15, 2015, Michigan radio went public with a leaked memo and an ACLU documentary by Curt Guyette. Brad Wurfel of MDEQ did not walk back comments “Let me start here – anyone who is concerned about lead in the drinking water in Flint can relax.” The memo details an EPA staffer’s concern about how the city tests for lead and results from a lab at Virginia Tech that show elevated levels of lead at one resident’s home and whether tests at other Flint homes with elevated lead levels are being included in the broader water tests that Wurfel referenced. That test shows levels that are high enough to be considered hazardous waste. After the Virginia Tech researcher Marc Edwards and Hurley Medical Center doctor Dr. Mona Hanna-Attisha released their findings, rather than take immediate or even precautionary measures, DEQ and DHHS criticized the other findings and allowed students and pregnant women to continue drinking contaminated water. In August 2015, the DEQ advised the city to begin a plan, but the concerns about lead levels were never publicized, and schools opened and children were allowed to keep drinking the water for two months although the Freeman sample tested six times the federal limit. ADVERSE IMPACT: Last month, a Hurley Medical Center doctor published a study showing that the percentage of Flint infants and children with above average lead levels had doubled citywide, and tripled among children in “high risk” areas of lead exposure (Zip codes 48503 and 48504). Virginia Tech researchers have said the city’s treated Flint River is very corrosive, causing lead from service lines to leach into tap water. Four of schools tested above 15 parts per billion for lead — the safety standard set by the federal government. Eisenhower had two samples of 16 ppb and 28 ppb, while Freeman had a sample that showed 101 parts per billion. DETAILS: The EPA made training for new Lead Copper Rules to all water department officials around the country. According to MLive Reporter Ron Fonger’s article When did the State know about lead in Flint’s water? The first indication of rising lead levels in Flint drinking water came from city samples soon after it changed its water source from Lake Huron to the Flint River. Results showed increasing lead levels with 10 percent of homes tested at 6 parts per billion of lead or more. The EPA training explains current testing methods findings are much lower than actual lead content, and because of the extreme health risk of lead, new sampling methods which would better protect the public would be mandated in the near future. According to the article, because the 6ppb were the highest lead levels measured in Flint by the city in more than a decade, and among the highest numbers in the state, (however did not meet the federal action limit of 15 ppb). In a companion article, Ron Fonger writes, “10 percent of homes sampled in the city’s most recent testing contained 11 parts per billion or more of lead, with six of 69 samples exceeding the federal lead limit of 15 ppb. Those are the highest lead levels measured in Flint by the city in more than 20 years, the state data shows. In contrast, the city’s tests of Lake Huron water from Detroit for one 10-year period — from June 2001 until September 2011 — resulted in just one of 155 samples registering higher than 15 ppb of lead. The article also states: “State records show 100 samples were collected from Flint in the last six months of 2014, showing two sites with readings of more than 15 ppb of lead and 10 percent of homes registering at 6 ppb or more. From January until June this year, the city collected just 69 samples, a reduction that was allowed because Flint’s population had dropped below 100,000, Busch said. That release is what Edwards’ testing has shown as 10 percent of homes sampled by students and faculty from Virginia Tech have had lead levels of at least 25 ppb. Michigan Department of Environmental Quality Director Dan Wyant said the state notified the city of the need to develop a lead action plan in August 2015, but the concerns about lead levels were never publicized as a potential public health threat until researchers from Virginia Tech University pushed the issue. WATER IN SCHOOLS: In the past seven days, the state tested Flint School District buildings for lead in water, finding three buildings that tested above the federal limits. However, A spokeswoman for the state DHHS just two weeks ago dismissed the Hurley study, saying the state’s more extensive data “is not in line” with the findings. The attempts of these department officials take into account the liability of the State, the Governor and other officials but not the health impact to the children and women who were consuming the water. 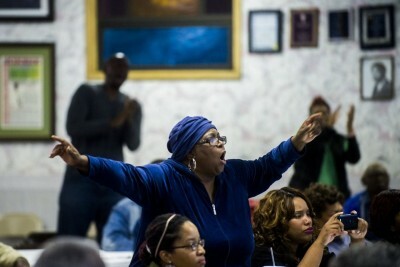 Dec. 27, 2014: Flint’s General Motors engine plant, citing high chloride levels in the water, switches off its hook-up to Flint, drawing water instead from neighboring Flint Township. Oct. 2, 2015: State officials tell room packed with reporters that there’s a problem with Flint’s water. DISPARATE IMPACT – Children born to women who drank the water may have cognitive impairments in the future, as well as their grandchildren. 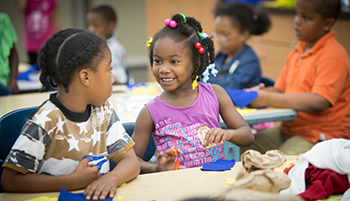 Flint is well represented by children, women and minorities. Depending on other pollutants in the water, such as endocrine disruptors, the decision may have also impacted the reproductive development of males. Thus the decision may have impacted the reproductive viability of the community. Moreover, the health impact would have continued to be swept under the rug if not for a doctor and a university going public. The State did not take the initiative to protect these populations or schools. The State has only offered to test children under 7 free of charge, when all residents who are of child bearing age should be tested. This is also qualifies as environmental civil rights issue which negatively impacted the poor. We believe other methods existed, and could have prevented this outcome, and those methods are the same methods being used now, to remain on Detroit water until the other system is completed. 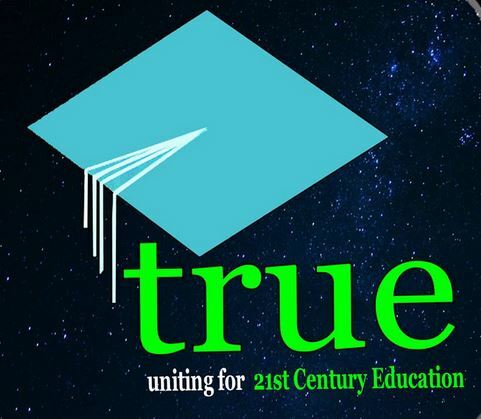 Many thanks to TRUE for standing up for the vulnerable children of Detroit. One has to wonder what kind of PTSD symptoms these children will have to deal with after going through the experience of finding out they have been poisoned, and then realizing that it was intentionally done. This is beyond greed and lack of regard for human life. Those responsible should face criminal charges for endangering lives. POVERTY is VIOLENCE – this is proof. I don’t know why they make such a fuss on this…Maybe because you can actually see it?? In River Rouge the air is so bad that people have not only breathing problems, asthma, bronchitis but have died from cancer (almost 1 person on every block). The mayor must be receiving a kickback from the E.P.A.. We know for a fact that Marathon oil doesn’t care (they bought out the Caucasian side a few years back on Oakwood. At the last town hall meeting it was said why buy out the poor, when you can just slowly poison them?! This has to be the most hanious act that I have seen perpetrated by a basically dictatorial government on the people that it is supposed to serve and protect. It is way past time for national investigation to take place here in Michigan. Once the investigation begins it is my hope that those implicated spend a great deal of time in prison with piped in Flint River water! The first time I spoke to Baxter, I cried. He has so much spirit and goodness. Thank you Diane Bukowski for continuing to shine a light on the fight for democracy in Michigan, and the justice seekers like Baxter Jones, William Davis, Monica Lewis-Patrick and Melissa Mays. CLEAN WATER AND SANITATION is a human right and emergency management compromises public safety protocols, procedures, principles and best practices. It is for that reason that Go Left America stands with the taxpayers of TRUE in calling for a restoration of local tax payer governance around the state of Michigan.